. The Minister made this call in his office on Monday, when he received a delegation, led by the Chief Medical Director of the University College Hospital, Ibadan and the Country Manager of Harvest Plus, also based in Ibadan. 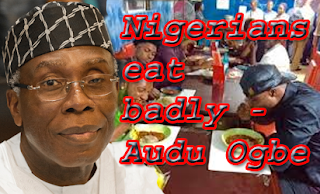 Audu Ogbeh The Minister stated that Nigerians eat badly, as most of our food contains too much carbohydrate, adding that “eating well is not the same as eating much”. The Minister also said, “If we feed better, illnesses and diseases will reduce.” Chief Ogbeh pointed out that there is serious crisis of malnourishment, with 37% of Nigerian children malnourished, and that this poses a threat to the future. He thus stated that Government is making serious efforts to ensure that Nigerians eat well-balanced food. “We need to spread the message far and wide”, the Minister stated. Governor of Niger State, Dr. Abubakar Bello, who was at the meeting, expressed satisfaction with the work of the University College Hospital and Harvest Plus. He invited Harvest Plus to his State for more discussions, as he looks forward to partnering with the organization. Earlier, Chief Medical Director of the University College Hospital, Ibadan, Prof. Temitope Alonge expressed interest in the expansion of the University College Hospital Agricultural Initiative (UCHAI), through the UCH Ventures. He disclosed that the UCH Ventures, which was registered in 2009, offers pre-retirement training opportunities in aquaculture and Fadama farming to its staff, aside improving the internally generated revenue of the hospital through the Ventures. He stated further that “the management of the hospital has deemed it necessary to expand UCHAI through UCH Ventures to accommodate retirees, some of who are still agile enough and willing to make a living through agriculture.” Prof. Alonge also stated that many of the health challenges at the Hospital’sstaff clinic and the geriatric center are nutrition related. In view of this, UCHAI has established a working relationship with Harvest Plus, an international organization at the International Institute of Tropical Agriculture (IITA), Ibadan. The relationship has a two prong approach, one of which is the sourcing for raw materials in various value chains in agriculture, and the second is on science of nutrition and healthy living, which is premised on fortification of foods. The Medical Director expressed his conviction that “the advent of fortification of staple foods in Nigeria through Harvest Plus will address epidemic of Diseases Related Malnutrition (DRM), which is a major but overt health challenge in hospitals.” He said that in aligning with Government’s vision, UCHAI seeks the assistance of the Ministry in provision of seeds, insecticides, fertilizers, farming tools and equipment. Country Manager of Harvest Plus, Dr. Paul Ilona called for a new or complimentary strategy to address the challenge of hidden hunger in Nigeria. According to him, this is due to the revelation from a study conducted in 2013, which indicated that there was only 13% compliance of Vitamin A in Nigerian foods. He stated further that, for our food to be more nutritious there is need to work along the value chain and ensure extra nutrients in Nigeria crops. He informed that his agency is assisting over one million Nigerian farmers to grow Vitamin A cassava and beans, adding that through the efforts of his organization, about 25 products now contain Vitamin A in Nigeria. He called for continuous support of the Ministry of Agriculture and Rural Development to enable his organization reach out to other States in Nigeria, and pledged that Harvest Plus will continue to work with other relevant stakeholders, especially the youth to ensure that Nigerians go for more nutritious foods. He used the opportunity to invite the Minister to the Nutritious Food Fair which will hold in Calabar later in the year.